When you think of going out for Peking duck, you labour at the thought of how you’re going to round up enough people to consume a whole bird. After all, this famous dish isn’t exactly small and then you have to order more food to go with the main course. Before you know it, the dinner turns into an elaborate affair fit for more than just a couple of folks. 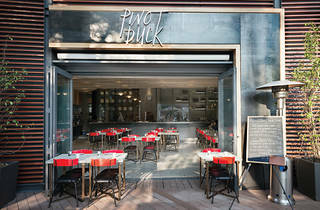 Pinot Duck, however, turns this Chinese dining tradition on its head. Here, you don’t have to lay into a whole bird. 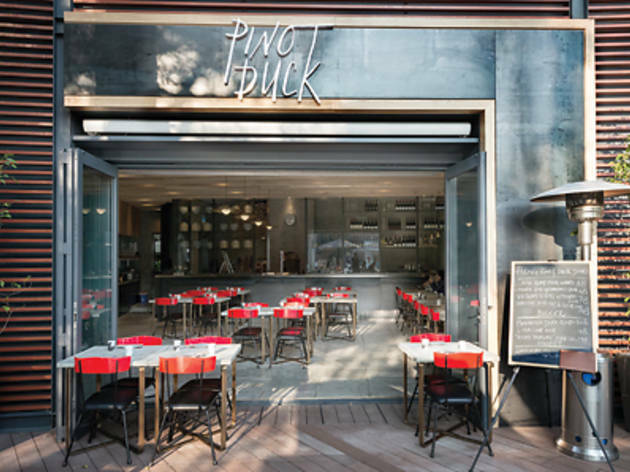 Instead, you can enjoy a range of dishes that use the Peking duck as the focus. Situated on the ground floor of Stanley Plaza, the bare concrete wall interior – reminiscent of Beijing-style courtyards – are broken up by a few pinewood panels that mix the modern with the traditional. Which is exactly what’s served on the menu. There’s also a wine list focusing on – you’ve guessed it – pinot red and whites. We dive in and try the classic Peking duck crêpe ($68) and steamed Chinese bun ($68). The crêpe is thin and porous, soaking in the hoisin sauce and the duck fat, while the bun is perfectly fluffy and adheres to the texture of the meat. We don’t find the duck itself anything phenomenal but it’s tender, juicy and works well with all the ingredients. Next up we plump for the brioche ($88), where roasted duck is served with charred pineapple drizzled with a pinot balsamic reduction. We’re pleasantly surprised by this dish as we love the fresh pineapple flavours that work with the bird. The brioche also absorbs the sauce and meat juices even better than the traditional crêpe. We also order a glass of 2013 Bannockburn Pinot Gris, Mount Difficulty ($90) to pair with the meal, as the name of the eatery implies we should. It’s light and although there’s no pairing magic, it still enhances the meal. We round things off with duck fat noodles ($98). Unfortunately, this is the most disappointing dish. The noodles are bland. All that’s needed is some soy sauce or good seasoning, which is a shame. Pinot Duck Shop G07, The Piazza, Stanley Plaza, 23 Carmel Rd, Stanley, 2772 0060; pinotduck.com. Dinner for two: $400.